For Samsung Galaxy S5 owners out there who love to express their feelings through emoji emoticons, this is for you. Included in this post is the step-by-step tutorial on how to attach those tiny, funny looking dudes to your messages. I have a feeling you already know that, so you can skip the first part and proceed to the section where you can find alternative apps that also support emojis. But for those who are still learning a thing or two on how to use their phones, this may come handy. Recent updates brought emoji support to Samsung devices. Those special characters, that look almost the same as ones in iOS, were embedded in the stock Samsung keyboard. The point is, you don't need to download third-party apps to be able to attach emoticons in your messages and that's good news...but there's a downside to that, too. You will learn in the later part of this post. Launch your messaging app, or any app that allows you to use the keyboard and send a message. Tap on the text field to input your message and pull up the keyboard. Locate the microphone icon on your keyboard and then press and hold it to pull up the sub menu. Aside from the microphone icon, you can see six other icons on the sub menu; tap the smiley icon. Now, you can now choose emojis you want to include in your message. That's it! Emojis are now included in your message. Tap on the smiley icon on the left side of the text field. 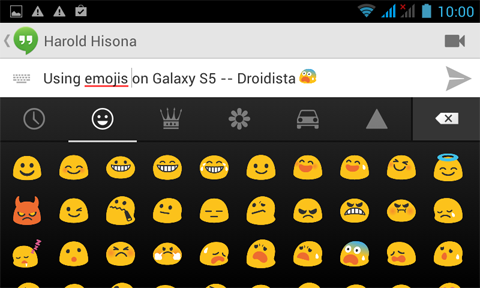 You can now view emoji emoticons available on Hangouts. Choose emojis you want included in your message. That's how you do it on Hangouts; it's pretty straightforward. Download and install the Go SMS PRO app from the Play Store. Tap the smiley icon on the right side of the text field. The first tab is for emoji; you'll know that as it is duly labeled. If this is the first time you used the app, then you need to download the Go SMS PRO Emoji plugin. Hit the Download Emoji button. After you installed the emoji plugin, go back to your message in Go SMS PRO and hit the smiley icon again. This time you will see all emojis you can use. As promised earlier, I will tell you one downside to using emojis embedded in the stock Samsung keyboard. When sending a text message (SMS) and you inserted an emoji to it, the SMS will automatically be converted to MMS. So, why is it a downside? You will need to mobile data to send the message. One of the reasons why many users encounter problems when sending messages with emojis is because mobile data is disabled. This is also the reason why I cited two apps that can be used as alternatives to sending messages with emoji emoticons. If you used Hangouts or Go SMS PRO, the SMS message will remain as such. So, as long as you have coverage, you can send messages. Question: Hi Harold, my Samsung Galaxy S5 can't send a message with emojis. But when I send the same message without emojis, it goes through. What seems to be the problem with my phone? It's a new phone and I'm worried about it. What can I do? Answer: Turn on mobile data in your phone when sending text messages with emojis as they are automatically converted to MMS messages. Question: I heard that my Galaxy S5 supports emoji but when I type a message, I can find anything that refers to emojis on my keyboard. Where can I find emojis? Answer: Find the microphone icon on your keyboard and then press and hold it. A sub menu will pop up, tap the smiley icon. You can find emojis there. I hope this post can somehow help you. If you, however, have issues with your phone, don't hesitate to email me at harold@droidista.com or join the small online community I use to answer questions of my readers. Don't worry its free.